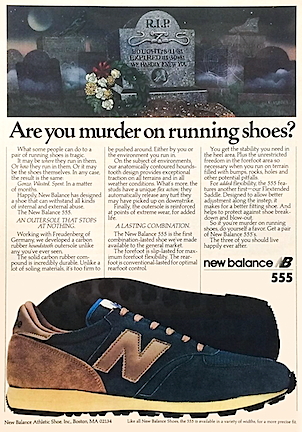 Are you murder on running shoes? What some people can do to a pair of running shoes is tragic. Gonzo. Wasted. Spent. In a matter of months. Happily, New Balance has designed a shoe that can withstand all kinds of internal and external abuse. AN OUTERSOLE THAT STOPS AT NOTHING. Working with Freudenberg of Germany, we developed a carbon rubber houndstooth outersole unlike any you’ve ever seen. be pushed around. Either by you or the environment you run in. On the subject of environments, our anatomically contoured houndstooth design provides exceptional traction on all terrains and in all weather conditions. What’s more, the studs have a unique flex action: they automatically release any turf they may have picked up on downstrike. Finally, the outersole is reinforced at points of extreme wear, for added life. 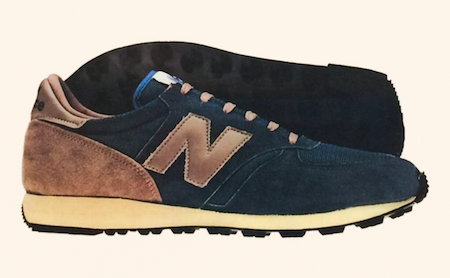 The New Balance 555 is the first combination-lasted shoe we’ve made available to the general market. The forefoot is slip-lasted for maximum forefoot flexibility.  The rearfoot is conventional-lasted for optimal rearfoot control. You get the stability you need in the heel area. Plus the unrestricted freedom in the forefoot area so necessary when you run on terrain filled with bumps, rock, holes and other potential pitfalls. For added flexibility, the 555 features another first – our Flextended Saddle. Designed to allow better adjustment along the instep, it makes for a better fitting shoe. And helps to protect against shoe breakdown and blow-out. So if you’re murder on running shoes, do yourself a favor. Get a pair of New Balance 555’s. The three of you should live happily ever after.